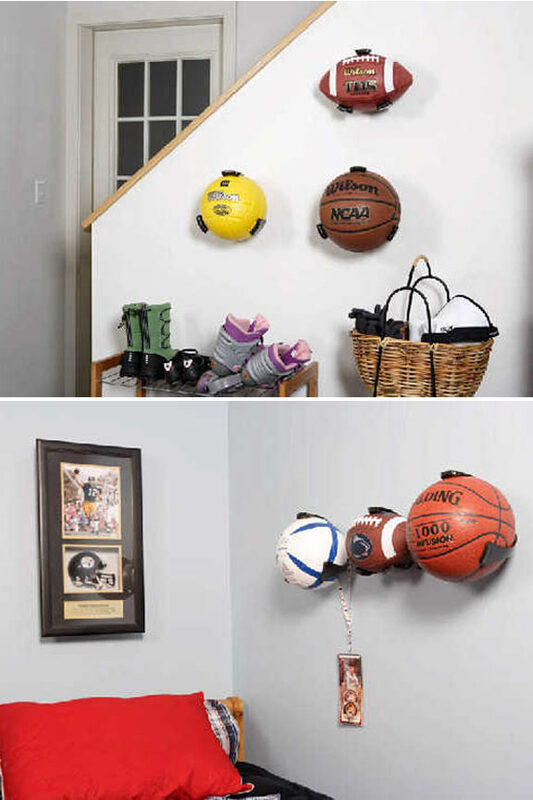 Mount Footballs To The Wall For Storage, Organization Or Display Purposes. 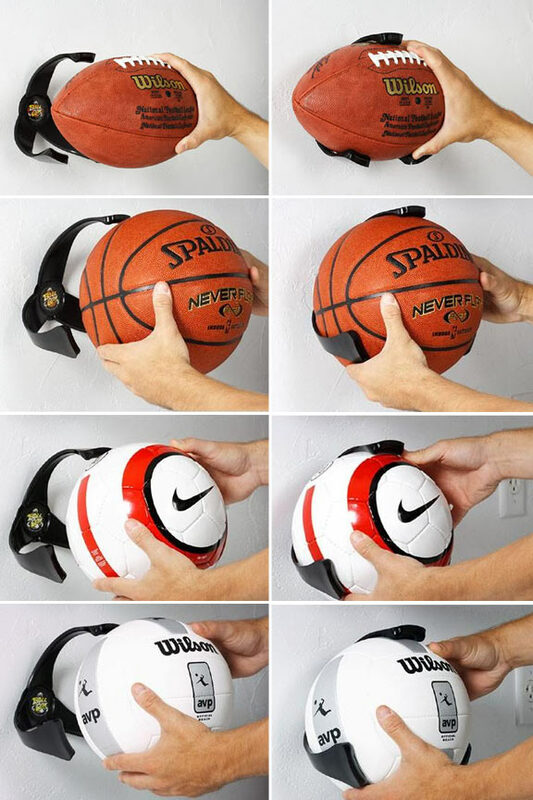 A great way to store, organize or display your footballs. This holder is both stylish looking and highly functional, so it makes an ideal solution for that pile of balls cluttering the floor of your garage, or that collectible one that keeps rolling off your desk. 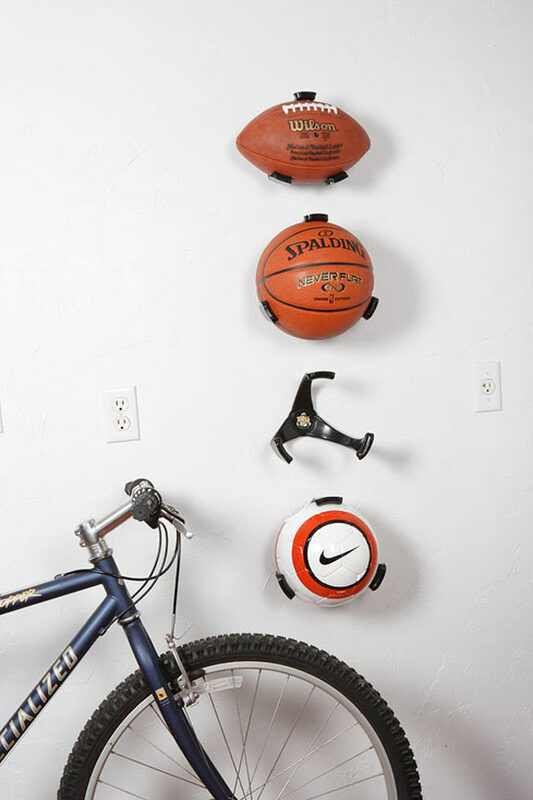 Quickly mount this football holder to any wall, and it will provide a clever way to hold balls when not in use, or display them permanently. It works with virtually any size football, and is so easy to use, that even a small child can insert or remove balls in a flash. A single motion will either pop it in, or slide it out, and while inside, the ball will remain secure and stable. Reduce messiness in your garage, basement or shed, and store balls off the ground to make them last longer. With the Football Ball Claw, you will never have to become frustrated looking for a ball to play catch, or get a backyard game going because it will be highly visible, and quickly retrievable. The sturdy and lightweight construction makes it easy to mount almost anywhere, and it works with balls from youth size all the way up to professional #3. It comes complete with all of the hardware you need to install it, so it will be ready to use in a matter of minutes. Because you probably play other sports too, you may be interested in the basketball or soccer versions that we also carry. Clever design and high quality materials combine to make this a highly effective storage device that is also incredibly easy to use. It is able to mount on any wall, and will even work when attached to a ceiling. With some additional hardware, it would even be possible to install one directly onto a goal post to hold extra balls while practicing, or store them when not in use. The super strong material is lightweight and slightly flexible, and these characteristics are key to the simple functionality. 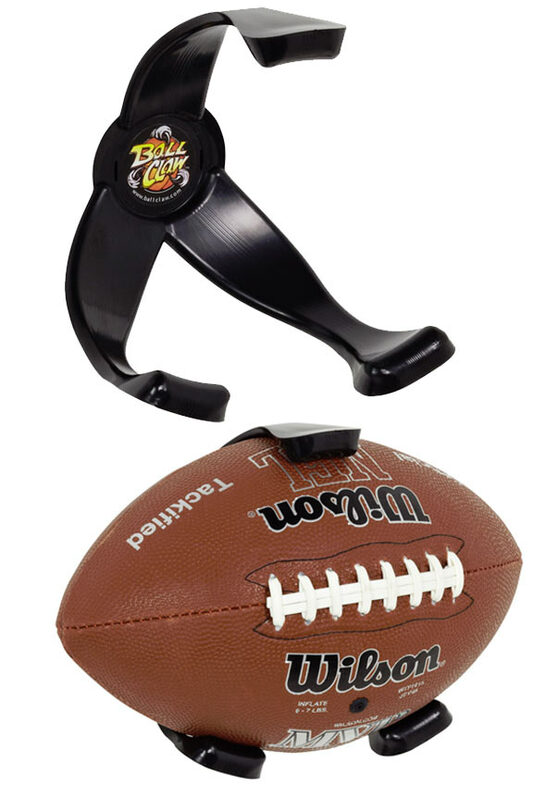 This football holder is essentially a plastic circle with three large, curving arms that sort of form a claw. To mount the holder in your desired location, you will simply remove the plastic cover that hides the screw holes. Stick it to the wall by driving the three included screws into the corresponding holes, and then replace the plastic face plate to complete installation. Once it is on the wall, it is ready to use, and operation will be easy for anyone. Mount it up high to keep special balls out of the reach of children, or mount several low to the floor to allow kids to easily retrieve their own balls, and then clean up afterward. To use this holder, you simply press the ball straight in, or pull it straight out. When you apply forward pressure, the arms will gently expand to allow the ball to slip in quickly and easily. Large, rounded tips reduce friction as you slide the ball, and then hold it in place once inside the claw. When the ball is installed the holder almost totally disappears, so this holder is simple, effective and better looking than most others. Because it is so easy to use, and versatile as far as placement, you can easily adapt it to fit your needs. Decorate a child's room, display a prized game ball in your man cave, or just provide an elegant solution to help kids find balls, and put them away when they are done playing. This football holder will enable you to eliminate clutter, and reduce frustration because your equipment will no longer be on the floor, stuffed in a bucket, or squished under a pile of other stuff. When inside the ball claw, your football will be highly visible, easy to get to, and protected from damage. The result will be saved time as you eliminate searching, and longer life of the ball because there is no risk of damage. Don't settle for a messy garage or shed. Use this holder on a wall, inside a closet, or even on the outside where it will really increase accessibility. The superior design and materials will continue to hold a gently strong grip for many years, and will never be effected by weather conditions. The possibilities are endless for this useful storage device. Order Yours Today! Dimensions 6.5" x 5.25" x 6.75"
Uses Perfect for display or storage. Offers and elegant way to show collectable balls, and also works well in garages, closets and sheds to organize and store regular ones when not in use. Compatibility Works with almost any football. Use with youth, high school, college and professional up to #3. Lightweight Yes - Super light and durable material allows you to mount almost anywhere,a nd ensures a long and useful life. Rounded Claws Yes - Large rounded tips help to limit friction when inserting a ball, and then helps to hold it in once placed inside the claw. Assembly Required No - Actual holder is a single piece, so only mounting is necessary for use. Football Ball Claw - Display that autographed ball with a single holder, or install several to keep the kids balls neatly organized when they are not using them. It will help to keep balls visible and also allow them to last longer due to lack of accidental damage or wear from rolling around on the ground. Order Yours Today! Thank you for follow up. Arrived, installed and I love them, my husband will be surprised today. Hope he likes them as much as I do. I NEED THREE FOOTBALL BALL CLAWS. DO THEY COME IN CLEAR PLASTIC? No. Not at this time. For now, black is the only color choice. do you post to Australia and how much =? We do ship to your country. Exact cost will vary depending upon what you order, and your exact location, so use the shipping calculator to see an accurate cost before you checkout.